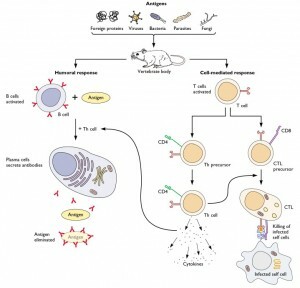 The immune response to viral infection comprises innate and adaptive defenses. The innate response, which we have discussed previously, functions continuously in a normal host without exposure to any virus. Most viral infections are controlled by the innate immune system. However, if viral replication outpaces innate defenses, the adaptive response must be mobilized. The adaptive defense consists of antibodies and lymphocytes, often called the humoral response and the cell mediated response. The term ‘adaptive’ refers to the differentiation of self from non-self, and the tailoring of the response to the particular foreign invader. The ability to shape the response in a virus-specific manner depends upon communication between the innate and adaptive systems. This communication is carried out by cytokines that bind to cells, and by cell-cell interactions between dendritic cells and lymphocytes in lymph nodes. This interaction is so crucial that the adaptive response cannot occur without an innate immune system. The cells of the adaptive immune system are lymphocytes – B cells and T cells. B cells, which are derived from the bone marrow, become the cells that produce antibodies. T cells, which mature in the thymus, differentiate into cells that either participate in lymphocyte maturation, or kill virus-infected cells. Both humoral and cell mediated responses are essential for antiviral defense. The contribution of each varies, depending on the virus and the host. Antibodies generally bind to virus particles in the blood and at mucosal surfaces, thereby blocking the spread of infection. In contrast, T cells recognize and kill infected cells. A key feature of the adaptive immune system is memory. Repeat infections by the same virus are met immediately with a strong and specific response that usually effectively stops the infection with less reliance on the innate system. When we say we are immune to infection with a virus, we are talking about immune memory. Vaccines protect us against infection because of immune memory. The first adaptive response against a virus – called the primary response – often takes days to mature. In contrast, a memory response develops within hours of infection. Memory is maintained by a subset of B and T lymphocytes called memory cells which survive for years in the body. Memory cells remain ready to respond rapidly and efficiently to a subsequent encounter with a pathogen. This so-called secondary response is often stronger than the primary response to infection. Consequently, childhood infections protect adults, and immunity conferred by vaccination can last for years. The nature of the adaptive immune response can clearly determine whether a virus infection is cleared or causes damage to the host. However, an uncontrolled or inappropriate adaptive response can also be damaging. A complete understanding of how viruses cause cause disease requires an appreciation of the adaptive immune response, a subject we’ll take on over the coming weeks. What exactly is “remembered” here? Since every viral particle is different, it would seem that the adaptive system needs to remember “similarities” and not just individual signatures. In other words, they seem to have somehow classified viruses by serial homology, in my view. Are there disadvantages to having too broad of spectrum of “memory” in different aspects of the adaptive system? How is that memory “tuned” and “modulated”? I remain intriuged by the notion that all this coding and “memory” in viral systems can be informed by the debate on mathematical linguistics. no longer neutralize the virus. More on this to come. lets say, a persons with multiple myeloma cannot make antibodies. These individuals are still able to clear viral infections from their body using their adaptive immune response. How is this possible? It’s possible that clearance of this particular virus is dependent on cellular responses – such as cytotoxic T cells. very clear and well written.. Please can you help. I have a low immune response to bacterial and viral infections which has responded well to both hib and prevanar vaccination. However I still have a low white blood cell response for which my GP has requested a blood test for lymphocyte sub sets. I have constant viral cold symptoms which are very debilitating and restrict my work capability and home life. Please can you advise if there is any treatment for such low immunity and perhaps comment on how this condition may have originated. I’ve been browsing online more than three hours these days, yet I by no means found any interesting article like yours. It抯 lovely value enough for me. In my view, if all webmasters and bloggers made just right content material as you did, the web will be much more helpful than ever before. Stop getting immunized. if you have low antibody production, any introduction of an antigen from a vaccine could wipe you out. antibodies in the blood stream have no correlation to immune system memory. Immune system memory is something that remains undiscovered. it is highly unnatural to stimulate the immune system to keep antibody levels elevated as elevated levels of white blood cells lead to autoimmune disorders. you sound to be immunocompromised and should not be taking vaccines left and right especially since there is not one scientific study in existence that can facilitate the theory that vaccines stimulate immune system memory. memory is the primary purpose of a vaccine, and it does not exist other than being exposed naturally to a virus.